Team GB is having an amazing Olympics, and after watching the amazing symmetry of the pairs diving into a green swimming pool, I thought I would strive “Citius, Altius, Fortius” to find a tenuous link between shipping and the Olympics. According to a genuine study entitled, “The Oxford Olympics Study 2016: Cost and Cost Overrun at the Games” by Bent Flyvberg et al of the Said Business School (University of Oxford, 2012, updated 2016), the Olympic games held over the last decade have cost, on average, USD 8.9bn to run. This is a huge capital cost, for what is sometimes a one-time use of the facilities. This average cost is equivalent to one tenth of the value of the Greek fleet. Indeed, compared to shipping, in economic terms, the stadia and facilities built to host a particular Olympic event can be seen as the means of production, in the same way as a vessel is the means of production in shipping. The accompanying chart compares the cost of the means of production of both industries. 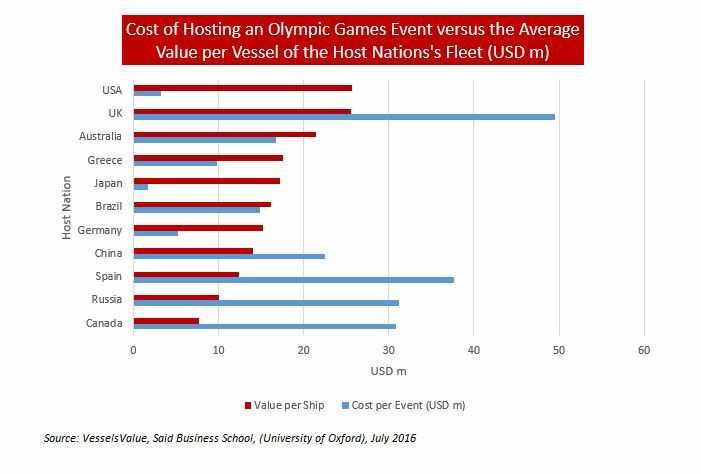 In other words, the cost per event at the Summer Olympic Games between 1972 and 2016 (where data is available) and the average VesselsValue market value of the host nation’s fleet. Is there a correlation? No, there is no strong correlation, (the correlation is 0.40 for those who are interested), but we can pick out a few highlights from the data. The USA has the highest value fleet at an average of USD 25.7m per vessel (due to the requirements of the US Jones Act), but spending on Olympic events was only USD 3.3m per event for the 1984 Los Angeles Olympics, and USD 15.3m per event for the 1996 Atlanta Olympics. These figures are below the median of USD 20m per event. The UK managed to spend the most at USD 40.5m per event at the 2012 London Olympics, but this does include the USD 90m spent on converting the main arena into a football stadium (for West Ham United FC). Interestingly, Brazil’s estimated cost per event is closely aligned to the average value per vessel in the Brazilian fleet (see chart). So while there is no link between shipping and the Olympics, there is some symmetry to be found, rather like watching the pairs diving into that green swimming pool.